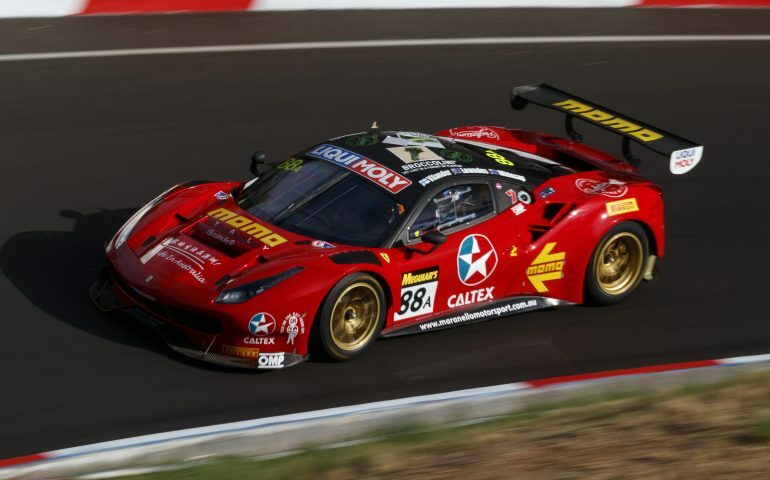 The #88 Maranello Motorsport Ferrari 488 GT3 of Toni Vilander, Jamie Whincup and Craig Lowndes has secured victory in the 2017 Liqui-Moly Bathurst 12 Hour. The final hour was nothing short of intense for the front-runners of the field, full of drama, crashes and more for a number of the top four. See below for more details. Taking victory in the classes were the #88 (Liqui-Moly GT3 Pro-Pro), the #12 Competition Motorsports powered by Ice Break Porsche (BRM Watches GT3 Pro-AM), the #912 Walkinshaw GT3 Porsche (Rydges Bathurst GT3 AM), the #21 Steve Richards Motorsport Porsche (myPlates Class B GT3), the #91 MARC Cars Australia Focus V8 (Racer Industries Class I) and the #19 PROsport Performance Porsche Cayman PRO (Avis Class C). As the twelfth and final hour kicked off, the #12 Competition Motorsports powered by Ice Break Porsche was handed a drive through penalty for the contact with the #32 JBS Australia Lago Racing Lamborghini at the close of the eleventh hour. Serving the penalty from third on the road, the #12 was thought to now be out of contention. Meanwhile, things were getting hot on and off the track, with the #29 Trofeo Motorsport Lamborghini catching fire in its pit stop. The fire crew acted quickly to put it out and send the car on its way. It was about this time, that the battle for the win really got down to brass tacks. With 59 minutes to go, Jamie Whincup pitted the #88 Maranello Motorsport Ferrari from the lead for fuel and tyres. This saw the #22 take the lead with Shane van Gisbergen at the wheel, with a 53.76second gap over the now second-placed Whincup. With 55 minutes to go, it was the #17 Bentley’s turn to pit, taking on fuel and tyres, and he would need no further stops. Meanwhile, the #22 was driving hard as van Gisbergen looked to establish the best gap he could before his pit stop, which came with 45 minutes left on the clock. The #22 team elected to not change tyres to save time, with van Gisbergen re-joining the track some 350m ahead of Whincup. It was well and truly ‘on’ at this point, with Whincup getting the tow through Conrod Straight to make a move on his Red Bull Racing Virgin Australia Supercars team-mate, and after some argy bargy between the two it was Whincup that would emerge at the front, quickly establishing a gap. Moments later, gasps were elicited around the track when van Gisbergen came into contact with the rear of the #51 IMAK Kwikmit Porsche, putting it into the wall hard at turn 22. This called out the 15th safety car for the Bathurst 12 Hour race and turned the attention of race control to the #22. On the restart with 20 minutes left to run, the #22 was given a drive through penalty for driver conduct, but it wouldn’t matter – just moments later van Gisbergen would make a mistake and spin himself hard into the wall to put himself and the #22 out of the race. The 16th and record-breaking safety car was called to retrieve the #22, with the restart coming with just five minutes and one lap left to run. Whincup controlled the field ahead of Matt Campbell in the #12 Porsche – once again in with a shot. However, there was nothing he could do with Whincup driving a faultless race to control the final laps and take victory. Aside from the #22, the only other entry penalised in the last hour was the #1 Tekno Autosports McLaren, for driving over a wheel nut during a pit stop.